Human Release! ¡Feliz Cinco de Mayo! What’s the best way to celebrate the famous win of Mexican underdogs against overwhelming forces? For me, it’s to run around like a crazy woman announcing the Human release! In your case, have some awesome Mexican food, relax, and pick up a copy of Human to enjoy while you munch. For those contemplating following me on Twitter, I generally don’t tweet links to buy my books other than on a release or sale date. On May 6, I should return to my usual tweet habits. Death? Acceptable risk. Taxes? No problem. Ancient magical cutlery of mass destruction? Bad, very bad. Following a brief foray into the world of superpowered vigilantism, extreme sports enthusiast and halfhearted tax preparer, Zita Garcia, wants her old life, her shiny new abilities, and none of the consequences. She’s even willing to hide her powers since the alternative means endangering her family and living life as a literal lab rat. Unfortunately, villains are searching for the pieces of a decrepit magic dagger, hurting innocents and fueling nasty anti-super protests. Her close friends, who helped before, are barely speaking to her, and one of them stands in the path of the violent hunt for the knife. Zita better dig out her mask—fast. 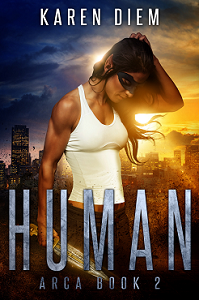 Human is the second in the Arca superhero urban fantasy series, and as a movie would be rated “R” for immoderate language, lame sexual innuendo, and comic book violence. While Human can be read as a standalone, it contains minor spoilers for the first book in the series. Human is currently available on Amazon, Kobo, iTunes, Barnes & Noble, and Smashwords and most major book retailers in both ebook and paperback format. To avoid boring people to tears, I’ve only listed the most popular places. If you’d prefer, you can read the first chapter before purchasing. NOTE: I am an Amazon affiliate. If you make a purchase from an Amazon link on my site, someday I may earn a few cents from it.